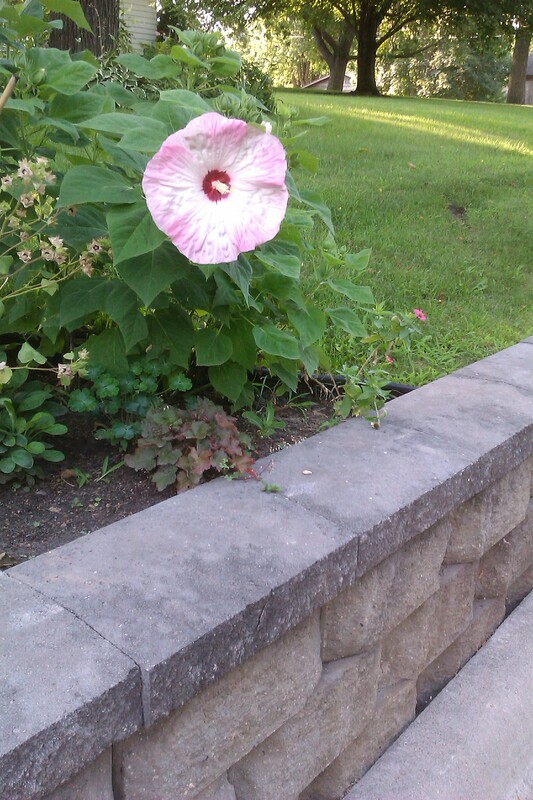 I am riding myself to work, minding my own business, when I pass by a blossom the size of a dinner plate. HUGE. I am a SD girl turned MN. We are small-bloom people, so a flower of this scale is a treat. Not to minimize the lowly peony, but this flower definitely minimizes the lowly peony. So–as is my business–I spend the rest of my ride developing the metaphor just waiting to be applied to this floret. This particular plant is obviously not native to our region, but it is interesting–and bold in it’s interestingness. You do have to be riding by on the right morning and in the right mood to appreciate it, but here it is in this goofy little berg of ours, just growing by the side of the road if we only bother to look to the right as we pass. This exotic plant is right in our midst if we only care to notice. Sure, there are hundreds of exotic plants that have been genetically engineered for generations to be hardy enough to survive our climate; so a hardy hibiscus in zone 4 is no big deal these days. But that is my point (working on the metaphor here): They are just like us. It is my contention that we live among exotic, unique people all day long, but we just ride on by, figuring that they are just average folk who live in this dinky town like we do; boring & unimportant. Maybe if we lay our assumptions aside and keep our eyes open, we will recognize them when they bloom.